This was a hackathon project for NY-Presbyterian hospital. After speaking with multiple nurses and hospital staff, we identified that communication after a patient is discharged is a concern. We wanted to enable patients to access their appointments, medication info and diagnostics in a secure way. This app aids discharged patients to communicate with their healthcare providers. It also allows users to view diagnosis details, appointments, and medications. 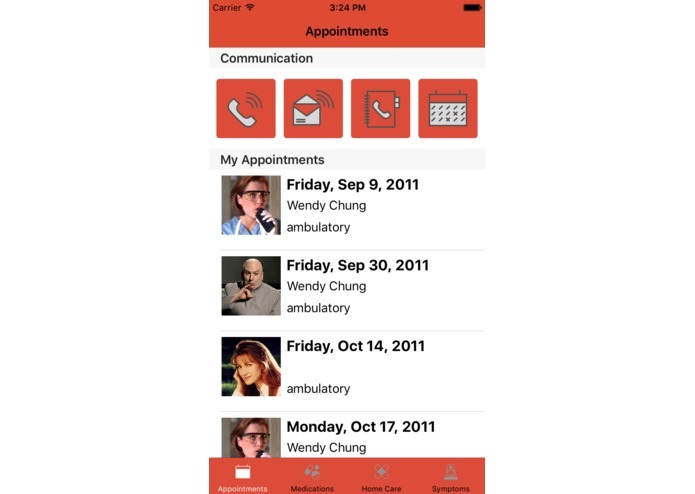 Furthermore, patients are able to set reminders for their medication and schedule appointments. We built an iOS mobile application that utilizes the data from the Patient, Encounter, and MedicationOrder endpoints of the FHIR API to display valuable information to the patient. We implemented open source code via CocoaPods including: AFNetworking (to access API data), SDWebImage (to show images from URL sources), RSBarcodeScanner (to scan patient id during onboarding), and ClusterPrePermissions (for push notifications). On the second day, the data was wiped from the API endpoints that we were using. We contacted Virginia and thankfully, she put us in contact with someone from Navhealth who was able to set up the lost data. We also had to work through some tricky merge conflicts as there were five devs working in storyboards. We attempted to alleviate this headache by setting up six separate storyboards. We also had to work around data limitations as the API did not provide everything. Patient privacy was a primary concern, to ensure HIPPA standards were met, we set up a scanning feature to access patient data. A user/patient can scan the barcode that appears on their discharge paperwork or wristband to access their health data. We also spoke with nurses about their number one discharge patient query, "Is this normal?" and added a tab containing normal and abnormal symptoms that a patient could easily access. Since many patients have a difficult time remembering to take their medications, we also added notifications, so that patients will get a reminder when it is time to take their meds. Tracking appointments is also a challenge, as a hospital books appointments, the API updates the patient's app, and they can view and then synch their appointments to their calendar where they can set additional notifications. There is also a detail view where patients can view their route and easily access important phone numbers. We learned that there are many voices in the NYP community ranging from staff to patients. As developers, it is important that we facilitate the transfer of information as seamlessly as possible, particularly by catering to any level of technological literacy. We worked to ensure the data was organized in a thoughtful and intuitive way. It’s essential to create a product that fills information gaps with simplest technology available. We hope to be able to have more time work with the NYP community and incorporate their perspectives in solving some of the communication pitfalls being experienced. Alternately, we could add analytics to anonymously view which features patients find most useful and which features to remove. In addition to medications, we would also like to include information on health care equipment, exercises, etc.